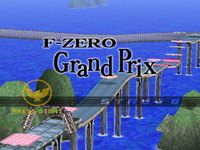 The F-Zero Grand Prix is the eighth stage of Adventure Mode in Super Smash Bros. Melee. After defeating the challengers of Pokémon Stadium, the player will find themselves stampeding across this race track in the Grand Prix, taking place on an F-Zero Grand Prix race. Being a race track, F-Zero racers will occasionally zoom through this course, potentially doing severe damage. If the player is lucky, they will find one of several floating platforms that they can leap to for safety. Somewhere towards the end of the course, the player will use platforms to jump across a large gap in the race track. Since F-Zero racers only hover about a foot over the ground, the hovercars will fly right above the player, rather than under them. After finishing the "race", the player will fight Captain Falcon in Mute City. Though the F-Zero Grand Prix race track bears some similarities to the Big Blue stage and is actually designed after a Big Blue track from the F-Zero series, it is not to be confused with the Big Blue stage available in VS mode. This page was last edited on April 6, 2018, at 13:59.